Unfortunately (or fortunately – jury is still out) I’m also health-conscious, and the more I read about the dangers of sugar, the more inclined I am to completely remove it from my tea – iced and hot. When your favorite thing to drink all of your life WITH EACH MEAL is sweet tea, giving it up doesn’t come easy. Most days it comes without tears, thrown objects, and sour looks at strangers – but it is not easy. I’m not trying to totally remove sugar from my life. No, thank you. I’m simply looking at all the places I can cut it out so that my overall consumption is much, much less. For me, not adding any sweetener to my coffee or tea (literally) cuts out a couple of cups of sugar daily. Yes, daily. Try not to judge. If you, like me, are trying to cut back on sugar, removing it from your drinks is a brilliant first step. Over the years with trial and error and error and error, I’ve found a few tricks. I hope they can help you – which, if we’re being honest, I believe they will. Why? Because if they can help ME, they can help ANYONE. Knowing why you are breaking up with sugar isn’t just enough – you have to keep reminding yourself of the reasons when he tries to sweet-talk his way back into your life. (if you need sugar to be a female, simply switch up the pronouns, I don’t mind). Diabetes, cancer, heart problems…. Ready to get serious? A lot of people say to cut out unsweet tea and only have sweet tea, maybe once a week, as a “treat.” This did not at all work for me. All it did was remind me of the sweet elixir I was now missing out on. I once actually stopped drinking sweet tea for a good three weeks (a huge landmark for me, as you’d imagine). Then, while dining out, I inadvertently, from YEARS of habit, said “sweet tea.” Sure, I caught it in time to correct myself, but I didn’t go that route. One sip and I knew I’d just fallen off the wagon and was now firmly underneath it clinging to my sugar laden tea. The three weeks did not become four weeks. I’ve learned that if you’re going to give it up… give it up for good. What you’re actually trying to do is develop a taste for, love for, and appreciation for the taste of unsweet tea. Reminding yourself of it’s overwhelming deliciousness is not going to help you. IF YOU, TOO, ARE A SUGAR JUNKIE…. Because of the ridiculous amount of sugar I used in my tea, I actually had a preliminary process before I completely gave it up for good. If you fancy that you might just be as bad as I was, this preliminary process may be helpful for you. If you think that you aren’t as bad as me (few are, honestly few are), you can skip to the next step. Two weeks before I cut sugar out of my tea for good, I began cutting back. Instead of adding a solid cup to each pitcher, I began adding 1/4 cup of sugar. When I got my own tea in restaurants, I gave myself half sweet and half unsweet. This preliminary process helped prepare my taste buds for what was to come. I had never done this in the past and I honestly think it was the main reason I was able to be successful this time. Tell your family what you’re trying to do. Let them know the dangers that sugar poses to your health and happiness (see list above). Ask for their support and help. They’ll be there for you. Heckity heck, if you share the list above with them (which you should), they will probably join you in your anti-sugar crusade. For your sake, I hope so, it’s simply easier when you have a mini army around you. However, if you are going it alone – it simply means you’re going to have to be a super hero and I believe you’d look FAB in a cape. As we’ve established, I was the Queen of Sweet Tea and I reigned for decades. So, if I found things that worked for me, I’m certain they will work for others. For some reason, making your tea a little stronger than usual helps you step away from the sugar. I’m finding myself falling head over heels in love with unsweetened strong black tea. It has a indescribable flavor that I find myself craving. Fruit. Fruit. Fruit. Fruit has a natural sweetness, along with crazy delicious flavor. Sometimes I make up a pitcher of raspberry tea and add a few frozen peach slices to my glass. The combo is a knock-out and I never even think about sugar. Another combo I’m crazy about is adding orange wedges or slices to raspberry, black, or green tea. It tastes delicious and smells like Christmas, how is that anything but excellent? 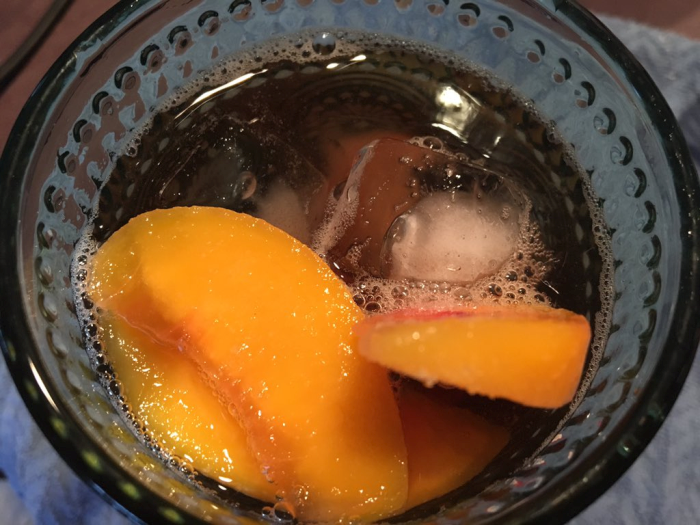 Adding frozen peaches to black iced tea or green tea is also fantastic. Mixing tea bags together is also something I enjoy doing. A couple of Tazo Zen Green Tea bags and a few of their Wild Sweet Orange bags make great hot or iced tea. Experiment with different flavored teas from online companies such as Adagio. Great tea has so much personality that you won’t miss sugar… trust me. 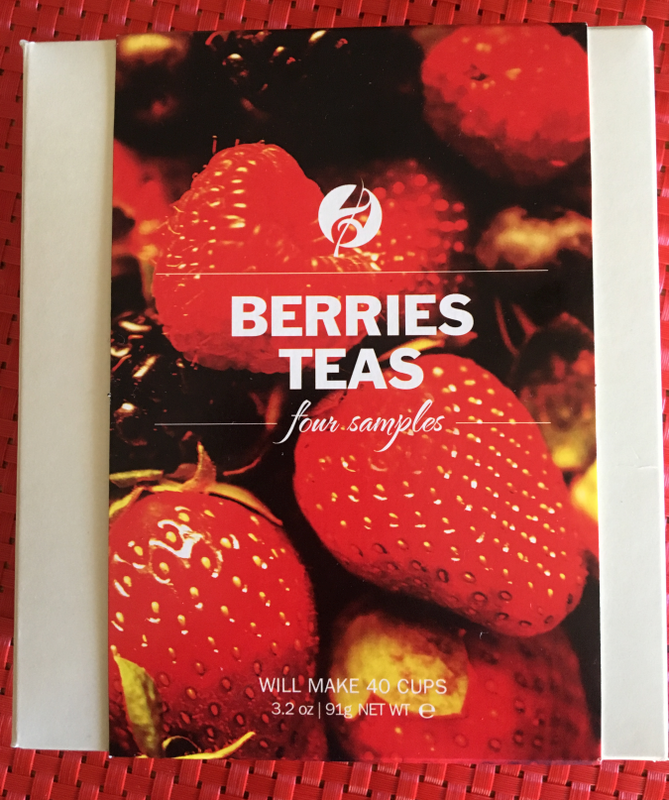 Their “berry” teas are better than any sweetened drink I’ve ever had… and you know that’s saying something. When in restaurants, ask for a lemon with your unsweet tea. It’s better than sneaking in a bag of frozen peaches. My husband frowns upon such things. Honestly, frozen peaches, lemons, and orange wedges are the keys to success. Like all healthy habits, once you’ve created it, you can’t let your guard down. Could drinking one glass of sweet tea undo weeks of progress sticking with unsweet tea. YES. Actually YES x 7 – the number of times it has happened to me. Write down the list of sugar’s nastiness above and refer to it when necessary. Quite frankly, it’ll take away your craving immediately. Also, this is a good time to point out that you need to kiss all of those bottled teas good-bye. The amount of sugar in them is pretty nuts. Most experts feel that these artificial sweeteners are EVEN more dangerous than sugar. If that doesn’t alarm you, go back and read the health dangers of sugar again, then say the words, “EVEN more dangerous…” It’s an eye-opener. After I picked myself up off the ground, I realized that my taste buds had been kind of retrained. They’d found that tea, in and of itself, is a delicious drink. It has plenty of fresh, pure flavor to stand on its own.